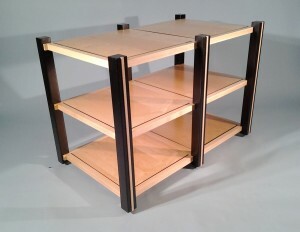 Inlay rack shown is solid maple for the legs and shelf frames. Shelving is MDF core with a maple veneer. This is a workhorse of a rack, that looks good while doing it’s job. Each leg has a wood inlay that may be a simple coordinated accent or may be highly figured special accent. Legs, shelf frames and shelves can be of different woods or finishes for contrast, or matched for a unified look. Legs are 2 1/4 inches square with the shelf frame notched into each leg, creating a stable solid platform. Shelves are a floating design, for vibration reduction. 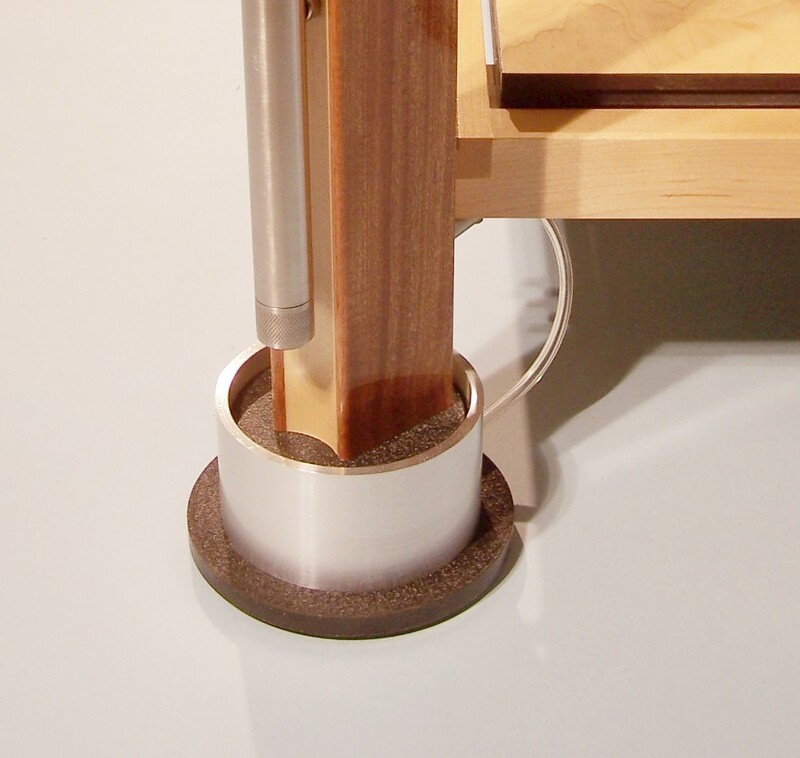 Shelves are also removable allowing use of custom shelves for further vibration isolation. Racks are available in maple, cherry, ash or any locally available wood species. Resonant Woods is a custom shop able to design and build to your specific needs and desires. Pneumatic suspension is the ultimate in vibration isolation. Isolators used in this rack are designed for vibration isolation with electron microscopes. Isolator shown is a static isolator, not needing to be attached to an air pump in continuous operation. Clear tube is attached to a schrader valve (tire valve), allowing adjustment of the air pressure for shelf leveling under weight. Each one of these feet is able to support 300 pounds. Shelves “float” on a cushion of air. Beyond pneumatic isolation, this rack has made use of constrained layer dampened shelving, floating shelves with isolation pads under each shelf, vibration resistant leg structure with dual density isolation tubes, and many subtle additional features. Pneumatic isolation may be incorporated at all levels if use, from a single shelf up. Please note: Racks are semi to full custom design. Due to the size and weight of their construction, racks must be shipped freight or picked up at my shop.